This article is about a past parliament of Germany. For the structure the body met in, see Reichstag building. For anything else, see Reichstag (disambiguation). The Reichstag (German: [ˈʁaɪçstaːk] ( listen), Diet of the Realm or Imperial Diet) was the Parliament of Germany from 1871 to 1918. 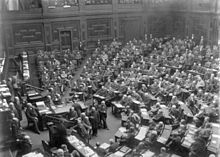 Legislation was shared between the Reichstag and the Bundesrat, which was the Imperial Council of the reigning princes of the German States. The Reichstag had no formal right to appoint or dismiss governments, but by contemporary standards it was considered a highly modern and progressive parliament. All German men over 25 years of age were eligible to vote, and members of the Reichstag were elected by general, universal and secret suffrage. Members were elected in single-member constituencies by majority vote. If no candidate received a majority of the votes, a runoff election took place. In 1871, the Reichstag consisted of 382 members, but from 1874 it was enlarged to 397 members. The term of office was initially set at three years, and in 1888 this was extended to five years. The Reichstag was opened once a year by the Emperor. In order to dissolve parliament, the approval of the Imperial Council and the emperor were required. Members of parliament enjoyed legal immunity and indemnity. The Reichstag first met in the Landtag of Prussia (Parliament) building in Berlin. From 16 October 1871 until 04 November 1894 it met in a former porcelain factory at number 4, Leipziger Straße. That 23-year "temporary" location was the scene of passionate political debates that are associated with names like Bebel, Liebknecht, and Bismarck. The premises were generally considered too small, so in 1871 a decision was made to construct a new building. In 1872, there was an architectural competition which attracted 103 entries by architects. 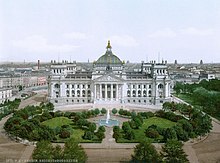 However, work did not start for some years, due to problems with purchasing land and to disagreements between Emperor Wilhelm I, Otto von Bismarck, and members of the Reichstag, about how the construction should be carried out. Ten years on, in 1882, another architectural competition was announced, this time with some 200 architects participating. The winner of the second competition was the Frankfurt architect Paul Wallot, who would eventually see his plan executed. On 29 June 1884, the building's foundation stone was finally laid by the Emperor. The new building was acclaimed for its cupola of steel and glass, an engineering masterpiece of the time. In 1888, before it was completed, Emperor Wilhelm I died, and 1888 was the Year of the Three Emperors. The third of these, Wilhelm II, objected to a much greater extent to the very concept of parliament as a democratic institution. The new building opened in 1894. The famous inscription – DEM DEUTSCHEN VOLKE (to the German People) – was added in 1916 by Peter Behrens, and it still towers above the monumental entrance. ^ Moonis Raza, Geographical Dictionary of the World in the Early 20th Century with Pronouncing Gazetteer (New Delhi, India: Concept Publishing Company, 1990, two vols), p. 712. Wikimedia Commons has media related to Reichstag (German Empire). This page was last edited on 27 March 2019, at 13:50 (UTC).